I have used Dovecot as my IMAP server since 2007. It has always been reliable and useful. Recently, I wanted to move my IMAP server to one host to another. I am the only user on this IMAP server. 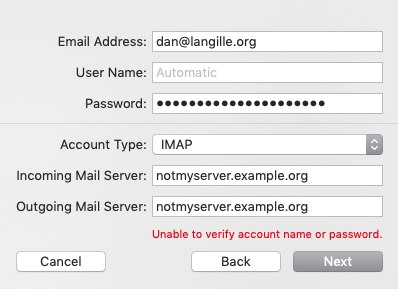 Wait, not I’m not, there are some test accounts on here, mostly used to verify that IMAP is running properly, but that’s no my point. The point is: we’re not moving thousands of accounts, just mine. I have installed Dovecot and Postfix in a jail. I like putting stuff in jails because it keeps things separated and clean. I can rebuilt a jail and not affect any other services provided by that host. I will be glossing over most of what I have done and I’m just highlighting the issues I encountered because those wasted the most time. The -6 specifies to connect via IPv6, because I can. I like doing things over IPv6 because the more traffic, the more likely more providers are to provide IPv6. The rsync took a few hours. Then I ran it again. You have to be careful to keep it in sync before you swap over your service or you will miss out on changes. I didn’t have any trouble with the rsync, so including this section goes against my declared ‘wasted the most time’ goal. This was the hardest part. I will show you why. Start in System Preference | Internet Accounts. Click on the + sign in the lower left corner. Click on Add Other Account from the right hand column. Then I got: Unable to verify account name or password. This is expected. 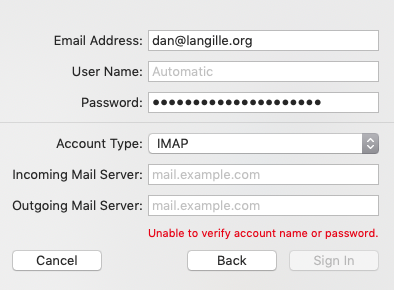 OSX does not know how to validate my credentials, so now it is asking for more information, such as server names. I filled in the details and hit Sign In again. Oh. Unable to verify account name or password again. What now. I had no idea how to fix this. 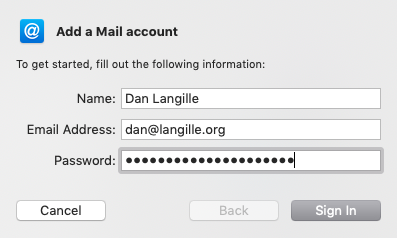 Much searching later, I found How to set up email in macOS Sierra Mail…. The solution: click on Next. Damn. That was so in-my-face that I completely missed it. I thought this was a hard-block. It wasn’t. Then I just followed my nose through the set up, and clicked save anyway when it said it could not connect. Later, you can set the password for outgoing smtp via Preferences in Mail. I had copied /var/db/dovecot/dovecot.users, via ansible, from my old configuration. On this server, the user IDs differ. I must update that. I will also change the user login and the password, which is what I should have done first. Notice that I have changed the login name to NewUserName and amended the UID and GID to match the output of id(1).